While digging through data and market research, it can be easy to get lost in the numbers. But when assessing these insights, what really matters is the stories they tell. This is a key point of emphasis for Gartner, and specifically its Smarter with Gartner content platform, which adds context and substance to trends surfaced by the research firm’s findings. We talk frequently on our blog about the crucial importance of storytelling – recently we discussed its impact as a trust-building tool – so we’re definitely on board with letting relatable narratives lead the way in content. We are eager to hear how Pemberton Levy and her team have woven this directive, and other elements, into the process of building Gartner’s highly-trafficked content hub from the ground up. While we wait for her September session, we did have a chance to ask Pemberton Levy for her views on some important content marketing topics. Here’s what she had to say about flipping the traditional marketing model, the value of “version 0.5,” lessons learned from writing a mommy blog, and more. What does your role as Vice President of Content Marketing at Gartner entail? What are your main areas of focus and key priorities? I lead content marketing for global marketing campaigns and the Smarter with Gartner and Gartner.com platforms. Gartner equips business leaders across all major functions, in every industry and enterprise size, with the insights, advice and tools to achieve their top priorities. I manage a global team of contributors who create original content for all major business categories in the form of articles, infographics, eBooks, and videos based on Gartner’s proprietary insights. My main area of focus is to ensure that our content is valuable to senior business leaders while meeting our key marketing priorities to attract prospects, engage and nurture them through the buyer’s journey. This involves continuously evolving our editorial and platform strategies, working with stakeholders throughout the organization, and evangelizing content marketing within the broader corporate marketing function. You created the “Story Comes First” method. How does this flip the conventional marketing model and why is it important? The Story Comes First method creates a structure for creating content that always begins with a story your reader can identify with and uses this moment to bridge their point of view with your brand’s unique selling point. Many marketers still talk about their products and services in terms of what they can do for their audience rather than what the audience cares about, why that’s important and how their solution can help solve the problem. Stories have the power to engage prospects with an emotional hook that endears them to a brand more successfully than standard marketing copy. How has social media changed the game for brand storytelling? Brands are no longer dependent on publicity with traditional media to influence target audiences. Social media gave brands their own “subscriber lists,” effectively giving them their own distribution channels for content marketing. You’ll be presenting at CMWorld on building a mature B2B content marketing organization. What, from your view, are the hallmarks of maturity on this front? In my three years building a content marketing organization with my colleagues at Gartner, my views have evolved on what signals content marketing maturity in a complex global organization. First, if you dig into your analytics, the data may tell a different story than what you see on the first page of your dashboard report. It’s not easy to get the right analytics so it’s important to constantly lobby for good data and pay attention to it. Second, what people do with your content may be different than what you intended. If you’re willing to listen to the data, it will be necessary, at times, to upend your strategy and head in a new direction. Which content marketing metrics and KPIs do you think are most critical to growth? Rather than list specific KPIs, which is a longer discussion that I will cover in the workshop, I’ll note that it’s important to be crystal clear what you are measuring and why. Our content marketing strategy centers around three key objectives and we have specific KPIs and related metrics for each objective. Everyone on my team is measured based on these objectives and KPIs. This is the best way to work towards the right priorities for the organization. What are some shortcuts you’ve identified in your career when it comes to striving toward content marketing maturity? One of the hallmarks of Gartner corporate strategy is to “get to version 0.5 and then test” and improve from there. This philosophy has allowed us to be agile and put new ideas into the marketplace quickly to learn what works. It’s how Smarter With Gartner was built and we constantly remind ourselves that when we are planning a new strategic direction, it’s best to find a way to do something quickly with low impact on resources first and build it out further based on data from our audience. Looking back, is there a particular moment or juncture in your career that you view as transformative? What takeaways could other marketers learn and apply? I wrote a mommy blog for four years that helped me learn how to tell stories and use dialog – all of which I brought to my content marketing career. The experience reminded me that I am an editor and publisher at heart and helped me find ways to create content, eventually for brands. My takeaway for other content marketers is to read and write what you love for recreation or as a hobby and bring the best of what you see across genres to your own work. You never know how it will fit but it’s important to stay exposed to the masters of our craft. I’m looking forward to the sessions on creating video since the format takes time and resources to make standout content. I’m also excited for the keynotes by Amber Guild of The New York Times Company and, of course, Tina Fey. Story Comes First. What’s Next? 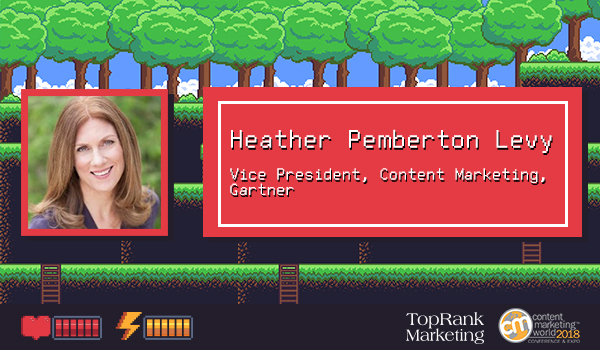 The post CMWorld Interview: Gartner’s Heather Pemberton Levy Shares How Story First Marketing Drives Success appeared first on Online Marketing Blog – TopRank®.